Are you clicking around the web from post to post hoping to learn enough how to build the most friendly checkout page for your customers? Take us with you for today. We believe you will find great checkout solutions built for salesforth. You’ve come here I am sure that you are using Magento for your online sales development. Magento is popular and perfect, Its reporting feature helps you monitor the performance and evaluate the progress of your online business. However the steps to make an order sometimes need to be simplified to help the purchase decision is simple and is quickly taken. The ability to checkout both for new customers as well as for registered users. Of course you can make not possible to buy without registering however we don’t recommend doing that. Guest checkout doubles a chance to get new order completed. 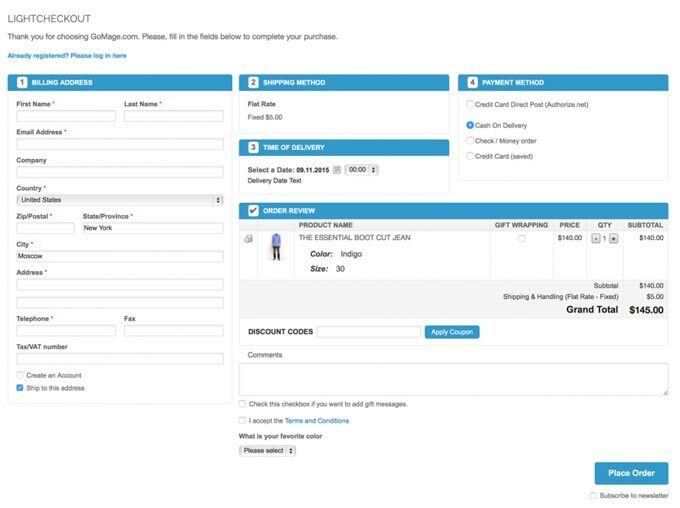 Easy to fill out shipping address fields are important part of the checkout flow. What you can do to help? Try to integrate the address validation and autocomplete feature. This will help users to navigate to another step faster. Offering alternative payment methods is always good idea. It truly improves a conversion. One of the last but also crucial checkout step is previewing the order details. Be close to your customers, let them leave comments and attach files to the order. Offering users tell more about their wishes is an excellent opportunity give clients what they expect. Why not to increase a loyalty. So how to get more users to go through the checkout flow and complete purchase. There are a lot of ways to success. If you are guru in web development you may start designing a checkout page. When you are not ­ make use of ready solution. 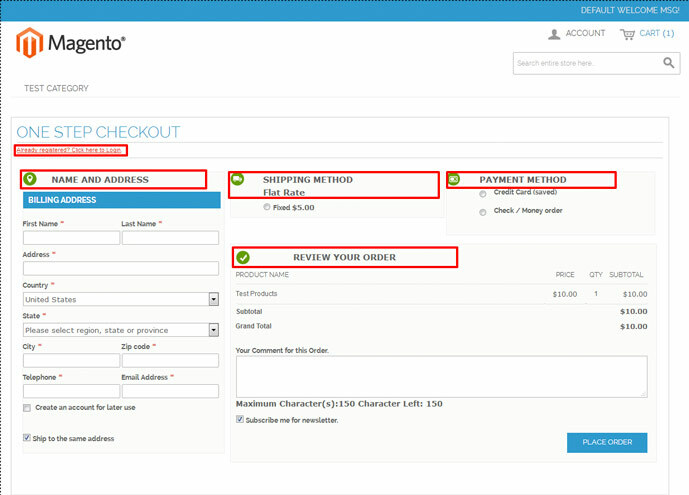 Magento Community is suggesting a range of checkout extensions. Will you get reliable result? Let’s compare solutions and find out what is the best one for you! What we see is clear interface with 1 checkout page instead of multiple boring steps. It looks gaining customers loyalty. FireCheckout extension has a responsive design. This is incredibly important, isn’t it. 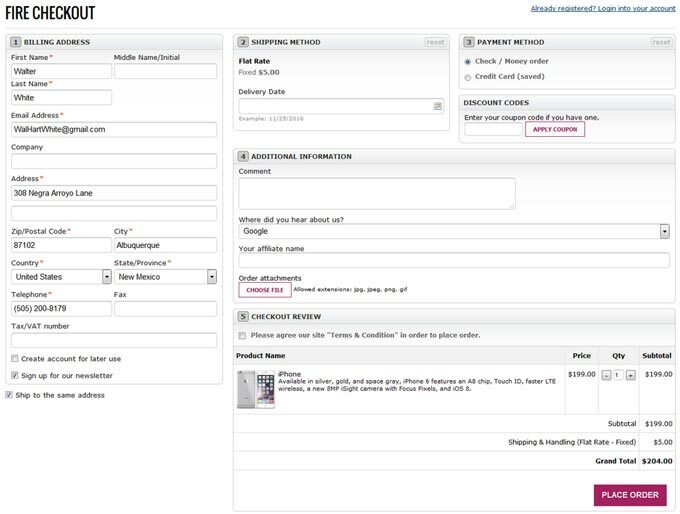 Three different checkout page layouts are available. They are fully customizable in the backend. You can change the sort order of address fields by using two user friendly modes, enable CMS blocks for additional content, set up to 5 additional fields with promotional or any other information. The status can be set as optional or required. Moreover, Firecheckout enables the custom field information display in pdf invoices, customer order view and in the order emails. Guest checkout is configurable option. VAT number VIES validation. Sounds great for european citizens. Integration with 100+ payment/shipping methods and third party modules. Wow! Firecheckout costs 189$. The price includes installation, 1 year free support and the use on multiple domains. With this extension, all the checkout information such as shipping address, billing address, payment method and shiping options will be displayed together for customers to fill/correct information in any step. 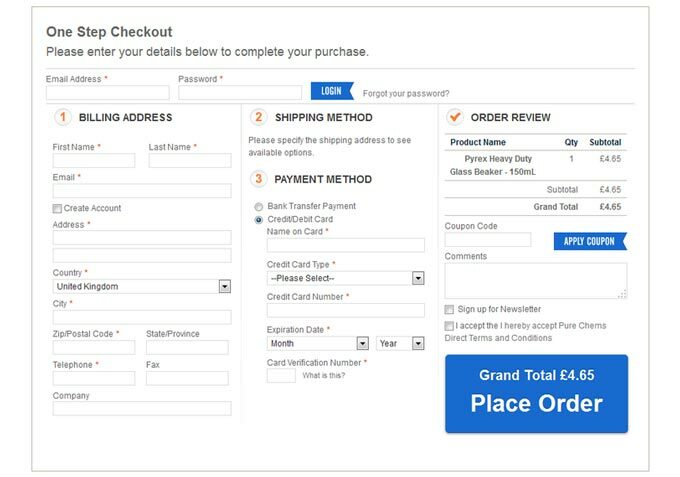 This extension to improve the customer checkout experience we have cumulate the Magento default 6 steps checkout process in one step. 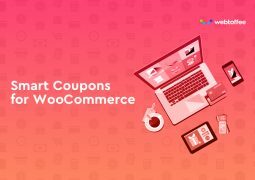 I think it will help the significant increase in your store’s conversion rate after installing One Step Checkout extension. Another advanced checkout extension is developed by MageStore company. This one page checkout with friendly interface looks great on any screen resolution. Clear shipping address fields, highly visual buttons and nice possible layout changes. 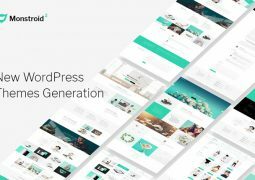 The module supports 4 type of layouts. The checkout page is also available in two designs. You are allowed to show/hide/rearrange/set required fields. Multistore feature is supported. MageStore team is offering this module for 149$ with free updates and 1 year support. One more great checkout extension with a lot of useful features is LightCheckout provided by GoMage. We like it. An awesome checkout page brings nice visual experience. 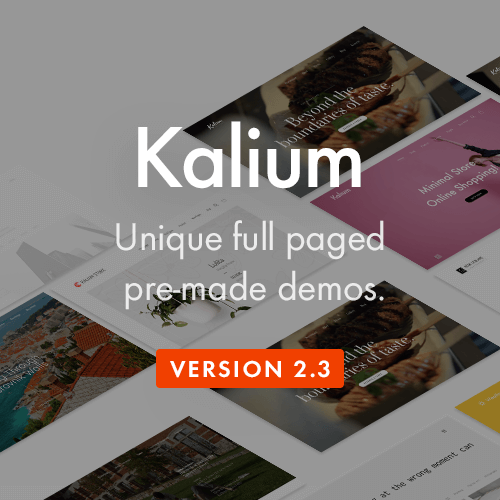 This extension allows you to select your own skin color for checkout page from the pre­installed color themes as well as to customize the block header. The checkout process is reduced from six steps to one. 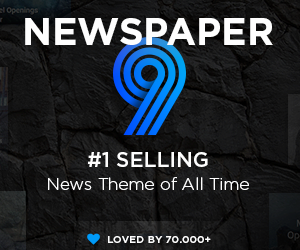 The responsive design makes the checkout suitable both for desktop and mobile devices. Within the configuration you can set up address fields as optional/required, change the thumbnail size and sort address fields. The module costs 169$ without installation fee. The team provides you with 6 month support free. 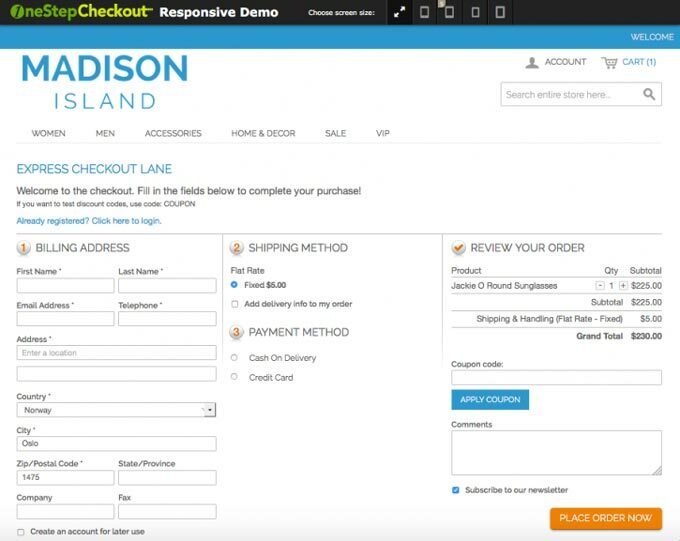 One Step Checkout created by aheadWorks provides customers with quick one page checkout. Responsive design is supported. Products can be easily bought by guests without logging. The module configuration allows you to exclude/include fields, make the shopping cart editable right on the checkout page and set up the default payment/shipping methods. What we like more is an ability to enable Related products block display in the bottom of the checkout page. 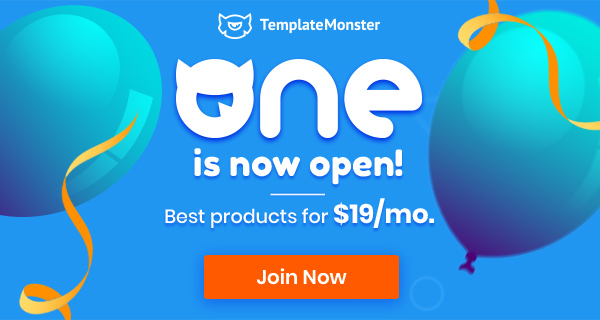 One Step Checkout costs 159$ with 3 months support included. You have to pay for the installation 55$. 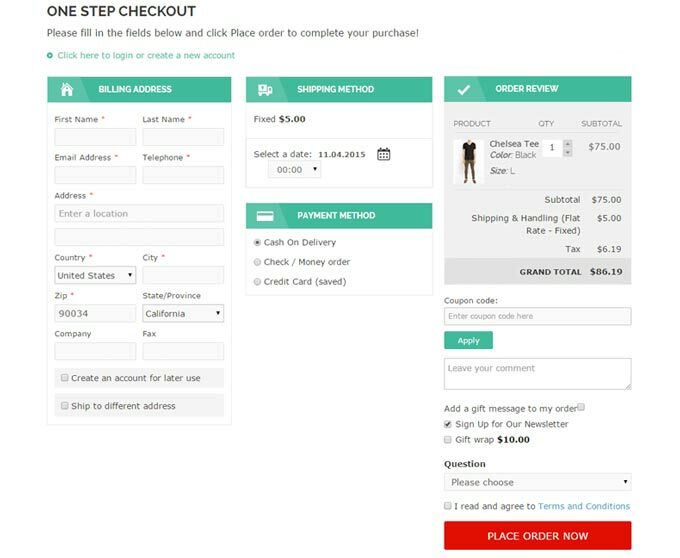 The last contender for today is OneStepCheckout designed by company with the same name. They promise fully responsive design for all devices. 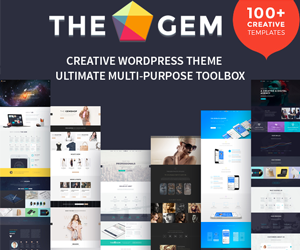 The module is available in 2 Magento editions ­ Standard and Enterprise. You can easily sort and set fields as mandatory/optional on the backend. In addition, the extension enables adding poll, comment field and gift wrap option on the checkout page. As we know One Step Checkout is used by many famous sellers worldwide. If you are ready to pay 245euro for Standard edition, 60€ for installation and 60€ for 6 months upgrades, please go ahead. 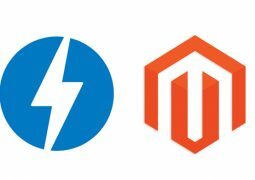 Among numerous one step checkout extensions on Magento market you may choose the best fit for you for sure. We hope our research will help you to get to the point. Remember that the checkout process should be as much well­planned as it possible. If you are ahead of the game you’ll get much more customers, higher conversion rates and maximum in sales–what’s not to like?